DoubleTune is an advanced tuning app created by professional musicians. It’s suitable for tuning a range of string musical instruments, learning new chords and refreshing your memory of already-learned ones. Competitive educational games are equally useful for beginners and mastered guitar players. One way or another, DoubleTune is a must-have app for any musician. Made by experienced guitarists, it is simple, fast, intuitive and accurate. It’s perfect for tuning acoustic, electric and bass guitars, along with ukulele, banjo, violin and cello. Tune Guard™ is a smart feature that helps you tune safely. It warns you with both visual red signal and string highlighting when this string is too tight and is about to break. The mode is designed to help beginners and inexperienced musicians save their strings, time and money. - And any other string instruments. 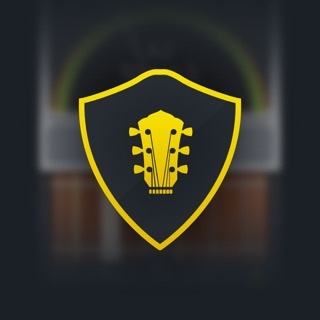 - Learn chords! Hone your skills and get familiar with many of common chords. These entertaining games focus on chords and chord diagrams. You can easily transfer this experience to real guitar playing! - Ear training. Learn basics of guitar music theory in a fun way. Master your musical hearing and chord recognition ability with the help of quizzes. - Stay competitive and try to get the best score in less time! Great for professional and beginner guitarists! Enjoy tuning your instruments at the astoundingly high level. * Tune Guard™ feature does not guarantee 100% safely tuning. Gismart Ltd. takes no responsibility for causing any damage to your strings. This ridiculous, for lack of a clean word to use that truly shows how ticked I am, app refused to let me bypass their intro without subscribing to their premium “trial”. The “trial” automatically begins drawing money after it is over and is darn (again, lack of a word) near impossible to turn off. How do I know? My second plan after closing out the app and clicking back on it again (The intro only appeared again) was to sign up for their subscription and immediately cancel. The instructions say you can close it out through iTunes. Okay, 1. iTunes is an incredibly hard platform to manage, as anyone without a computer science degree who has spent five minutes trying to work the thing out will agree with. and 2. This is an APP. iTunes is for music! That’s why it had “Tunes” in the name! And lastly, I DON’T HAVE ANY MONEY TO PUT ON MY CARD TO EVEN SIGN UP FOR THE THING! I’M DOWNLOADING A FREE GUITAR TUNER APP, DO YOU THINK IM ROLLING IN DOUGH HERE? ALSO, THE PREMIUM FEATURE IS $8.00? Seriously, this app is ridiculous. Maybe if they got rid of this marketing scam at the beginning of the app I would be able to actually see the rest of it, including the actual tuner portion. DON’T BUY UNTIL THIS SCAM IS OVER. Thank you for the time spend on sharing with us your user experience. Please accept apologies for all this inconvenience. If your intention is to unsubscribe, please follow the link for a step by step guide: https://support.apple.com/HT202039 But you can also enjoy our free version of the app choosing a limited version of the app. You're always welcome to contact us at support@gismart.com for the assistance. Have a nice day! It's a guitar (and ukulele) tuner. Whether you need a reference tone, a chromatic tuner, or to tune to a standard or common tuning for the instrument, this app gets it done. Nice UI, very intuitive. The only reason I'm giving it four stars rather than five is that if it could also handle bass, mandolin, banjo, bouzouki and other stringed instruments in the same way as it handles guitar and uke - or if it allowed me to create a custom tuning of my own in order to mock up the mandolin or banjo - it would fit my needs perfectly. UPDATE: since my initial review, 12-string guitar and 4- and 5-string bass have been added, and this app has absolutely become my go-to for tuning, and I’m bumping it up to five stars for that. If the mandolin and banjo could be next, it would be absolutely perfect. I downloaded this app probably close to a year ago and didn’t like it as much then. The ads were very annoying and I found it difficult to figure out how to set up the tuning for either other instruments or keys. I used the app again today after months of not and I’m very glad I kept it around. All I had to do was open it and start plucking my strings. It lets you know when your string is in tune and prompts you to move on to the next one until you are finished. It’s simple, easy to interact with, and most importantly, free. It’s a perfect tool for those of us who carry their phone more often than a tuner.